The Commonwealth Government has approved a new food labelling system to ensure consumers have all the information they need to make informed choices about the products they buy. The new labelling system, which will show where products are made, grown or packaged, will begin to appear on supermarket shelves later this year, according to Minister for Agriculture Barnaby Joyce. “The new labels will be easy for shoppers to identify. Consumers will no longer have to search for country of origin information hidden in small print,” Mr Joyce said in a media statement. 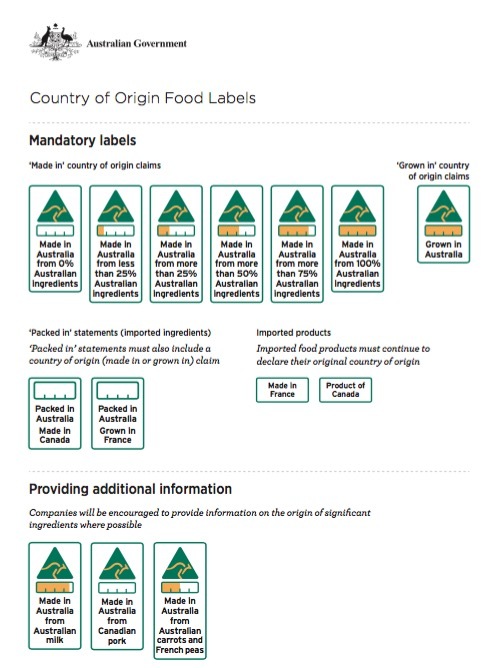 The Australian Made Campaign has welcomed the Government’s proposed new country-of-origin labelling system for food, which will incorporate a bar chart showing what proportion of ingredients come from Australia. “We welcome the Government’s initiative to help consumers quickly and easily identify great Aussie products,” said Australian Made Campaign Chief Executive Ian Harrison, adding that the proposed new “contents symbol” will be mandatory for most food products. He said the new labelling system will also include – for those products made and grown in Australia – the Australian Made, Australian Grown kangaroo logo. “The Australian Made Campaign contributed significant input during the development of this proposal and looks forward to working with the Government to efficiently and effectively implement the new scheme,” Mr Harrison added. The new labelling system will also clarify the definition of “made in” Australia, which means producers importing ingredients and simply slicing them will no longer qualify for a “made in” claim. Additionally, if a product is imported into Australia and then re-packed, the label will identify where the item came from. According to Minister Joyce, the mandatory rollout will commence in 2016, with a phased implementation period for small business.